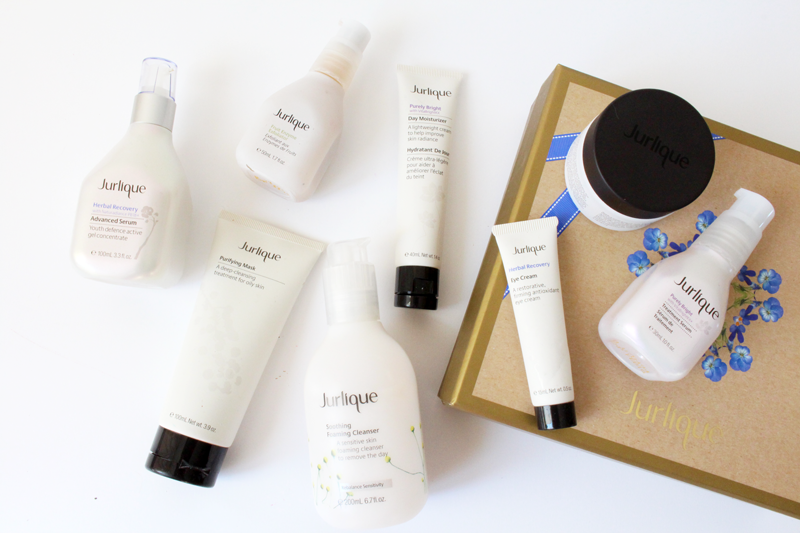 Jurlique were a brand that featured heavily in beauty wishlists, but yet somehow, after months of lusting, no products had worked their way into my collection. …Until recently, that is. A little while back I went a bit Jurlique crazy and ended up with the little selection you see above. The first products that landed on my doorstep were the lovely Jurlique Soothing Foaming Cleanser, which was a Kate influenced purchase. I’ve been using this pretty much every single morning since I bought it, as it’s very refreshing to use and doesn’t irritate or dry out my sensitive skin, despite having ‘foaming’ in the title. It’s a great cleanser and one I can see myself repurchasing. Next was the Jurlique Fruit Enzyme Exfoliator, which I use around twice per week to add some clarity and radiance to my complexion. After a clay mask, I apply a thin layer of this and the fruit enzymes buff away dead skin cells, leaving my skin soft and bright with all signs of congestion gone. It’s one of my favourite skincare purchases! Next to arrive was the Jurlique Herbal Recovery set. There was a set of three products in this box, which makes an amazing gift, I think. First, the Jurlique Herbal Recovery Eye Cream which I was so excited about, as I’ll try anything to banish my dark circles. I tend to use this during the day as it’s quite lightweight, but adds a serious dose of hydration and has a brightening effect on the eyes. You only need a small amount too, so the tube will last a long time. Next is the Jurlique Herbal Recovery Advanced Serum, which is one I reach for a lot when my skin needs to be restored. By that, I mean when it’s looking a bit stressed, congested or just needs something to get it back to normal again. It’s a great overnight serum and in the morning my skin looks lovely, especially when used with the Jurlique Herbal Recovery Night Cream. This has quite a thick consistency, but doesn’t feel heavy on the skin and is wonderfully hydrating and restoring. The whole Herbal Recovery range is just so nice to use and one I will continue to reach for time after time. Another product I love to sort out my skin and one that calms down blemishes is the Jurlique Purifying Mask. The scent is one you have to get used to (think strong herby tea leaves! ), but it does really even my skin out, getting rid of any irritated feeling and really purifies my complexion, as the name suggests! When used a few times a week I think it really helps blemishes too. The last products to reach my collection are from the Jurlique Purely Bright range, as I do love a good brightening product, as my skin is prone to being quite dull. If I’m after more of a treatment, I’ll go for the Jurlique Purely Bright Radiance Serum. As you can imagine, this works to improve skin texture and clarity, lightening any discoloration and evening out skintone. I just love how much clearer this makes my skin look, as I typically follow it with the Jurlique Purely Bright Skin Brightening Day Moisturiser which is an additional brightening boost. It’s a great lightweight moisturiser, which is perfect for my combination skin and gives it more of a radiant look. Everything from Jurlique has a very natural, floral or herby scent so if strong smells aren’t for you then I’d go and test some products in store first and see if you can get a sample! Jurlique have such a huge range of products to pick from, which all focus on using natural extracts to target specific skin types and conditions, so you’re bound to find something for your skin type. The Jurlique team are really helpful too and are more than happy to answer all of your questions (like they did for me! ), especially on twitter. I recently joined their Google Hangout, which you can watch here and get some tips from one of their leading educators! It was such a lot of fun and I’m so happy I was involved. Have you tried anything from Jurlique or are now considering it?